For thousands of years in Mexico, a most remarkable dog has held center stage. 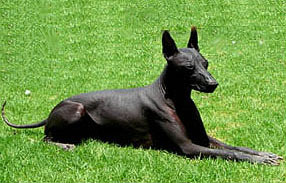 This special dog, whose breed goes by the name of Xoloitzcuintli, or Xolo for short, is best known for the fact it is hairless. As a result, this particular breed is very popular with asthmatics as well as people who are extraordinarily neat and don't like to clean up after dog hair. The Xolo's attributes extend beyond its appearance, however. Xolos are known to be great companions for their human caretakers, affectionate and extremely loyal. They make great watch dogs as well. One of the most striking characteristics of the Xolo, beyond its appearance, is the great deal of heat that its body emanates. Physiologically, the breed doesn't truly register a higher temperature than that of other dogs, but its hairless state makes it a great deal warmer to the touch. Because of the extraordinary heat that the Xolo produces, many sufferers of rheumatism have found great relief by being in direct contact with the dog. 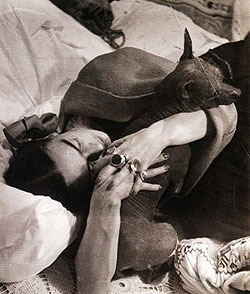 As well, throughout history, Xolo's have provided much needed warmth to their human companions on cold winter nights. Some owners of the breed even half jokingly compare their canine companions to being animal heaters. Xolo's have long played a role in Mexico's past and were highly regarded in many of its ancient cultures. The Aztecs deeply revered the Xolo and believed the breed to have mystical healing abilities. Indeed, the dog owes its name to the Aztecs, who named the breed after their God of lightning and death, Xolotl. This root word was then co-joined with the word for dog, 'itzcuintli' to form the name Xoloitzcuintli (pronounced 'Show-low-eet-squint-lee'). For the Aztecs as well as several other pre-Columbian civilizations, the Xolo dog possessed not only healing properties for the physical body but also for that of the spirit. These dogs were frequently buried with their masters, in the belief that their accompaniment would help the departed soul navigate the underworld successfully and find its journey safely home. Not only were actual dogs buried alongside their caretakers but statues of these dogs were placed in tombs to ritualistically serve the same purpose. The famous Colima dog statues are the premier example of this. Clay statues of hairless dogs have been found in the thousands in burial sites in Mexico. Highly collectible, these ancient artifacts illustrate the extraordinary importance that this dog held in ancient society. Additionally, as horrifying as it sounds, the Aztecs, along with other Mesoamerican societies would eat this breed of dog. 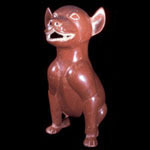 It was believed that the flesh of the Xolo, much like the dog itself, had medicinal properties. The breed comes in 3 sizes, toy, mini and standard and range in weight from 10 to 60 pounds. Not all Xolo's are hairless, in fact, one-fourth of all pups born do have hair. Hairless Xolo's, however, do have special needs. If placed in a very cold environment, the dog needs to be kept warm with a sweater or wrapped within a blanket. On the other hand, in a hot and sunny environment, owners typically rub their Xolo dogs down with sunscreen as they can sunburn. This is more critical with light skinned dogs than with those that have dark skin. When applying lotion, it is advisable to be conservative with its use as to not clog the dog's pores. Xolo's are not yet officially recognized by the American Kettle Club. This is expected to change shortly, however, as the dog breed is gaining in popularity. Since the 1950's, the Mexican Kennel Club has recognized the breed with a registration program in place.